Cardassians, newlyweds and why counselling should be given to veterans who've experienced trauma. The Enterprise is attacked by a Cardassian ship near a border almost a year after a truce between that species and the Federation. The Cardassian Commander (or Gul) says that a Federation ship destroyed a Cardassian space station a couple of days ago. Picard doesn't know anything about this and tells the Gul that the Federation wouldn't do that, he promises to investigate so the attack is halted. Starfleet confirms that the Phoenix, captained by a guy called Maxwell, attacked the Cardassian station. Picard is ordered to work with the Cardassians to find Maxwell and bring him back, while keeping the peace. The Cardassian Gul (who I think of as not-Dukat) comes aboard with two aides to observe the Enterprise's progress through Cardassian space. 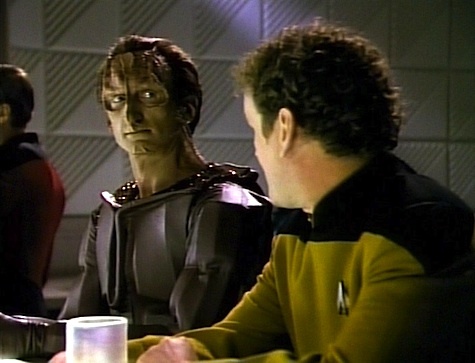 It turns out O'Brien (whose new marriage is marred by unsatisfactory breakfast) served under Captain Maxwell during the war with the Cardassians and so he's asked to advise on Maxwell's character. O'Brien admired Maxwell and insists there must be a misunderstanding. Maxwell lost his family in a Cardassian attack and the Gul believes it's a revenge mission, though O'Brien insists Maxwell wouldn't do that. O'Brien is cold to the visiting Cardassians, even when they try to be friendly. 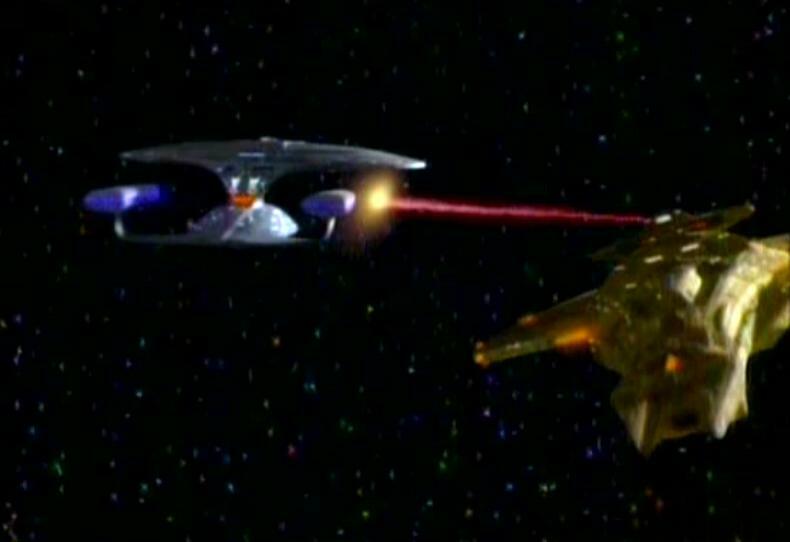 The Phoenix is found approaching two Cardassian ships. Picard refuses to take the military option as the Gul wants, but Maxwell ignores the hails from the Enterprise and the Phoenix flies aggressively. Picard orders Worf to give a Cardassian ship information that will help it stop the Phoenix, but the Phoenix destroys both Cardassan vessels anyway. Picard orders the Enterprise to pursue the Phoenix. After talking to Picard about Maxwell, O'Brien apologises to a visiting Cardassian about being rude before. They talk a little about the war and O'Brien shares a haunting memory. They catch up to the Phoenix and Maxwell beams aboard, all friendly-like. The two Federation Captains talk and Maxwell reveals that he thinks the Cardassians have a secret base near Federation space and the ships he took out where supplying it. 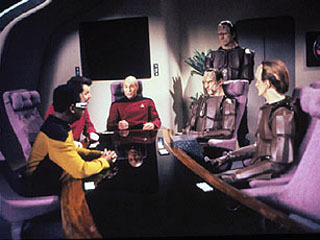 Picard orders Maxwell to come back to Starfleet with him, but spares him from arrest. Maxwell seems to agree, but while en route the Phoenix veers away and goes after another Cardassian ship. Maxwell tells Picard to board it and see for himself, but Picard refuses and wants to stop the Phoenix instead. O'Brien knows the Phoenix and her Captain, so he beams aboard to speak to Maxwell, who realises he can't win. Maxwell surrenders his ship and is confined to quarters for the trip back to Starfleet. Picard has a final word with the Cardassian Gul about peace, he thinks Maxwell was right but he didn't want to start a war. 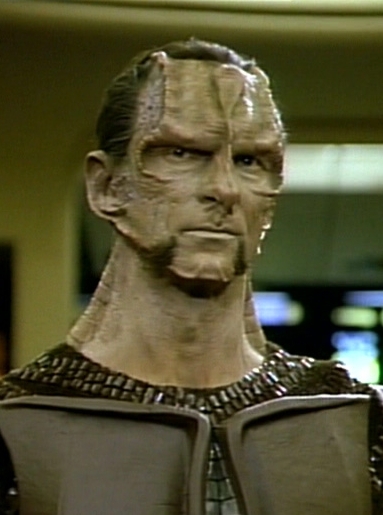 The Cardassian Gul is played by Mark Alaimo, who plays Gul Dukat in the Deep Space Nine. He looks different, not quite like the later Cardassians (facial hair, darker skin, different forehead), but the voice is the same. This means that at no point do I believe anything this guy says, though at least he doesn't seem quite as phoney as Dukat could be. Of course he's not trying to be pseudo-conciliatory here. Picard does his usual thing of being sensible and firm and diplomatic. He stalls the Cardassian attack on his ship, he balances the security of Starfleet ships against keeping the peace and promoting good relationships with their allies. He doesn't want to believe a fellow Starfleet Captain would make an unprovoked attack on an ally's ship, and that belief delays him and means ships are destroyed. Picard is stern with Maxwell, but still treats him with respect. It's only once Maxwell has proved himself unreliable that Picard treats him like a criminal and removes him from command. Picard comes to believe Maxwell, but he won't disobey orders and knows promoting peace is the priority. At least Starfleet now know to be wary of their ally. Worf doesn't like Cardassians, for no clearly defined reasons. I get why he doesn't like Romulans (what with them slaughtering his family), but I think this is the first time we see Cardassians so why should Worf dislike them? Does he just dislike other warrior races? Do they all have this way of snarking at each other? Is it a macho thing? Also Worf should never be allowed to say things near any kind of peace conference. "Trust is earned, not given away." While he has a point he doesn't seem to realise that it's the same for both sides. Worf makes sensible security suggestions regarding the visiting Cardassians, including a security detail and restricted access to sensitive parts of the ship. As ever Picard is all like 'oh silly Worf.' I get that the Captain doesn't want to make their guests feel like prisoners, but securing sensitive parts of the ship just seems like it should be the standard policy. There' really no good reason that everyone who comes aboard should have the run of the ship. 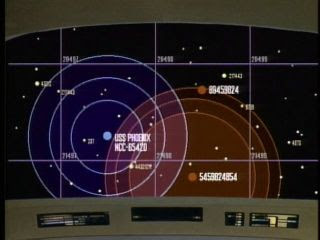 Riker agrees with Worf that access should be limited on this occasion. Though no one actually cites all the times that such limitations would have been useful in the past, so it's not clear whether they're learning or whether its prejudice. Newly-wed O'Brien is dissatisfied with the vegetarian seafood breakfast Keiko serves. She says it's what she's used to. O'Brien is used to stodgier breakfast food and wants to show this to Keiko, even though she doesn't seem keen. What I don't understand is why they don't just eat what they both want for breakfast. I mean it's replicated food, you just ask the hole in the wall for what you want, so it's not like anyone's going to any effort. I have been married for over six years and I can probably count on my fingers (maybe toes too) the number of times me and my husband have had the same breakfast. I think this is meant to show Miles and Keiko getting used to each other, seems odd to me that they weren't living together before they got married. O'Brien is cold to the Cardassians when they suggest a friendly drink, but later tells Keiko he thinks it's bad that people still hold things against the Cardassians. I think that might have been his way of acknowledging his behaviour without admitting to it. Keiko sensibly points out that it's understandable people who fought in the war would still have bad feelings towards their erstwhile enemies (something Starfleet don't seem to have realised). O'Brien pretends to feel fine but it's clear that he doesn't. Later O'Brien sits down with one of the Cardassians and they share their regrets about the war. O'Brien is haunted because he had to kill someone. O'Brien's loyalty to Maxwell is strong and it's clear that they through a lot in the war and deep bonds were formed among those who served. O'Brien initially gets touchy when it is suggested that Maxwell was the aggressor and insists there's something else going on. He doesn't want to admit how war has affected the man he admires. After O'Brien's own realisation about how the war affected him he realises that the same must be true of Maxwell. His knowledge of the man and the ship mean he can get through where others can't. 1. Senior staff report to Picard and the Cardassians, O'Brien talks about Maxwell and gets a little heated considering he's not normally invited to these meetings. 2. Picard and Maxwell talk. At first Maxwell talks to Picard as a respected equal, but when it's clear Picard doesn't approve of what he's done Maxwell calls him a bureaucrat and gets increasingly agitated so Picard gets firm. So up until a year before this episode the Federation had been at war with the Cardassians? This war has presumably been going since before the Enterprise's first flight, since O'Brien fought in it, so why haven't we heard about it? We don't know what it was about or why it started or ended. Shouldn't Maxwell have been given counselling or a psych evaluation after his family were killed in a wartime raid? Couldn't he have been posted anywhere besides the Cardassian border? There doesn't seem to have been any provision for the mental health of those affected by military action. Way to go Starfleet. A warship with a crew of 600 and a supply ship with a crew of fifty were illegally destroyed by the USS Phoenix. Picard tells the Gul that he believes Maxwell's claim about the base, the different is that he wants to protect the peace. Picard tells the Gul to warn his leaders that the Federation are watching. It's been a bit of a grim month, lets hope things look up soon. Anyway, here's a blog post. The journal of an android who muses about behaviours he doesn't understand and comments on the feelings he pretends not to have. -A Vulcan Ambassador arrives and is secretive; she arranges for the Enterprise to rendezvous with some Romulans in the Neutral Zone. -Data is being father-of-the-bride to Keiko, a friend of his who we've never met before and who is due to marry Chief O'Brien that day. Before the rehearsal she tells Data that she's changed her mind about the wedding and asks him to tell O'Brien. O'Brien is not happy about this. -Geordi goes to the hairdresser and Data tries out friendly insults, he is not good at it. -Data and Worf look at potential wedding presents together and parallels are drawn between them. 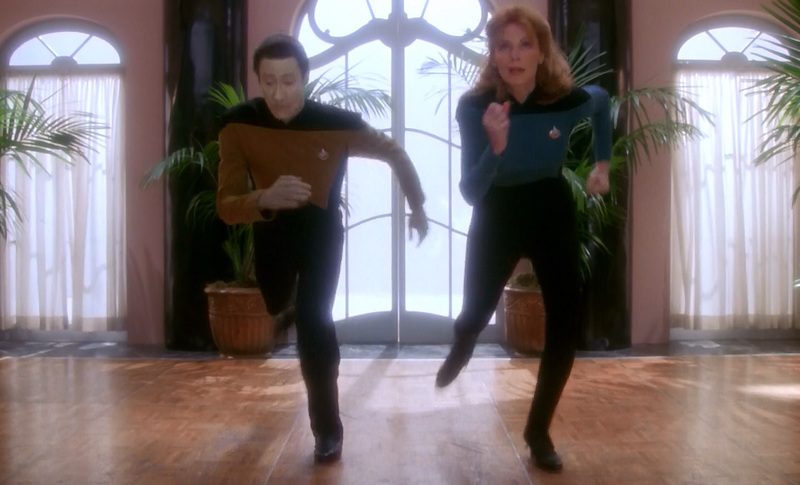 -Data asks Dr Crusher to teach him to dance because she used to do it competitively. She agrees to secret dancing lessons. Data demonstrates his ability to mimic tap dancing. Then Crusher teaches him basic ballroom moves when she realises he wants wedding-appropriate dancing. Data practices dancing with a holodeck partner, he does not practice non-creepy smiling. 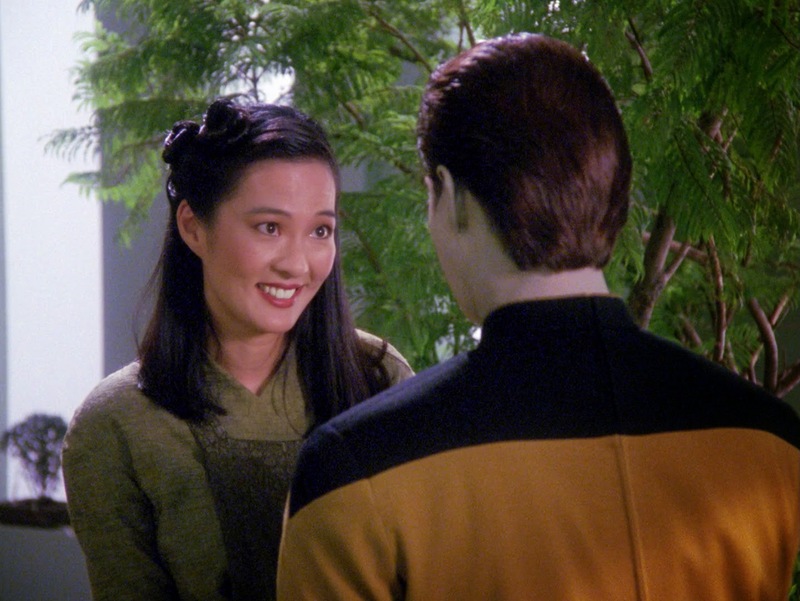 -O'Brien awkwardly asks Data to talk to Keiko about the wedding. O'Brien reckons that because Data has known her longer and worked with her that means the android will be better equipped to talk to her about their relationship than him, her fiance. -Keiko doesn't respond well to Data's involvement. 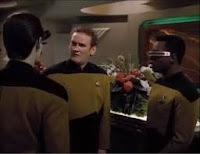 Data goes to visit Troi and they have a chat about how to support friends. They also discuss marriage, which is not a thing that Data (the self-professed emotionless android) has ruled out for himself. -The Vulcan Ambassador asks Data suspicious questions then tells him she was just testing. Data wishes he had a gut instinct about this situation, thereby ignoring the gut instinct he presumably has about this really dodgy situation. 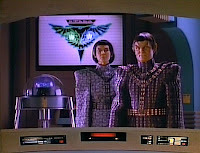 -The Ambassador dies in a transporter malfunction while beaming over to a Romulan ship for secret talks. Picard is angry as are the Romulans. 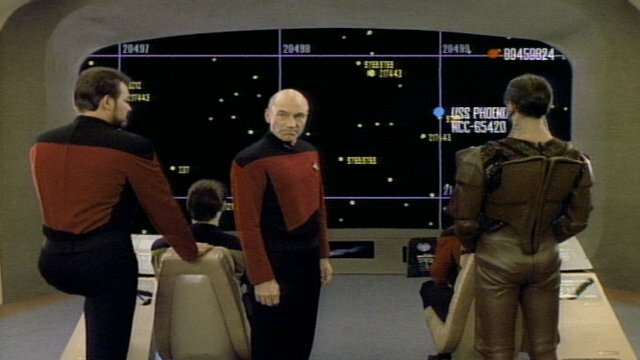 Picard orders Data to investigate. -Data muses about Sherlock Holmes over a montage of investigating things. He asks Crusher to check genetic stuff from the transporter and it looks like the remains of the Ambassador are fake. -Turns out the Romulans beamed the Ambassador away themselves. Picard goes after the Romulan ship and demands the Ambassador is returned, he is stern in the face of military threat. 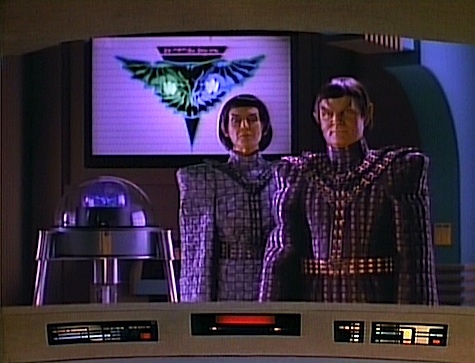 The Romulan captain reveals that the Ambassador is actually a Romulan spy and so no one has been kidnapped. 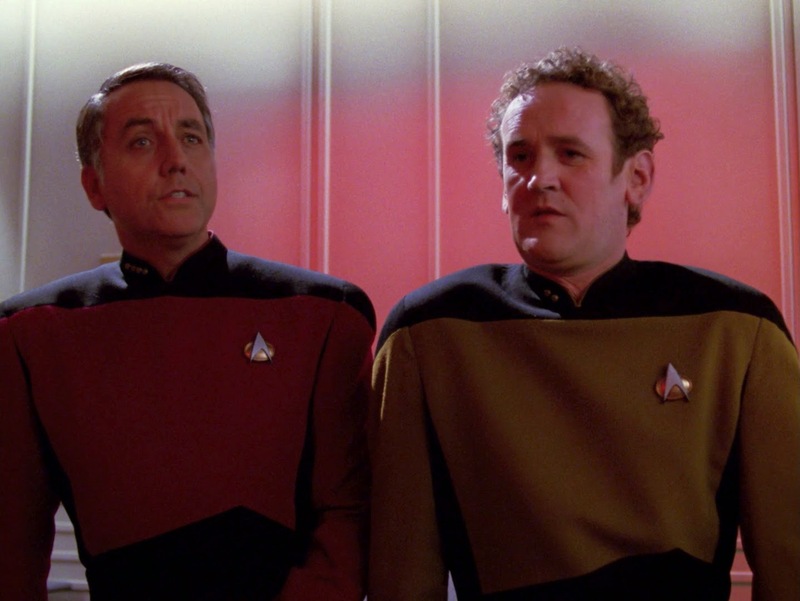 The Enterprise leaves and Riker makes a comment about bears that's only vaguely relevant. 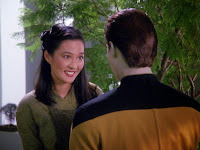 -Data apologises to Keiko for getting involved her relationship (even though she dragged him into it in the first place), but she's all happy and says the wedding is back on and blithely passes over the idea that anything might have been different. Data is not the only one who is confused by this. 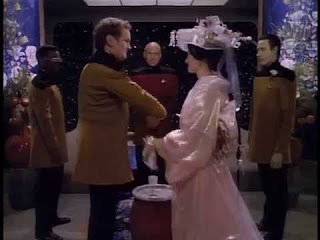 -O'Brien and Keiko get married, Data dances at the wedding. -Data and Picard look at a newborn baby, as you do. Data's day is pretty full because he doesn't need to sleep and I assume what we see here is roughly a 24-hour period, meaning other characters are probably resting off-screen at times. Data has a cat now, I don't think we've seen this cat before and we aren't told about it now, it's just there. I think there's a lot here to support my idea that Data is not as emotionless as he claims, that he does experience emotions but distances himself from them. I don't think this is necessarily something he is consciously doing, but this episode suggests that it's a reflex for him. Data tells Maddox that he found friendship hard because humans puzzle him, but he developed a programme to predict human emotional responses to certain things. I reckon that this is part of Data's own emotional growth, and just because he had to do it more consciously than humans doesn't change that this is similar to how children develop understanding of and empathy towards others. There are a few times when Data says something about lacking feelings or instincts, but in a way that suggests he's actually experiencing these things but not consciously processing them. "It is fortunate that I am able to perform my duties without emotional distractions. If that were not the case a sudden course correction... would make me very nervous." If you aren't nervous why even bring it up? Why would you think this situation would make you nervous if you are incapable of nervousness? Plus after the dodgy Ambassador acts downright suspicious Data muses on how he lacks a gut instinct to back up his conclusions, which to me suggests he's got an instinct that something is up, but because it goes against his knowledge he feels he can't act upon it and dismisses it. I mean it's not unusual for humans to experience that and push their feelings aside, so of course Data's not going to realise that's what's going on with him. I get that this could be a way of the writers evoking emotion in the audience when observing things through an emotionless character, but I like my explanation better. Data mentions that he would probably fit in with Vulcan society better because of all the logic, which I'm glad was addressed because I'd been thinking that for a while. Though the fact that he thinks their philosophy is limiting suggests he has preferences for things he can do in human society, which sounds as though he likes things. Liking things seems emotional to me, even if it is only basic. Plus Data was created by and in the image of a human, so it makes sense that that's the species he wishes to emulate. Data says: I am rarely in need of [Dr Crusher's] professional services... But I often observe as she practices medicine on others and have learned a great deal about human interaction from her. It's clear that Crusher's dancing background is something she keeps fairly secret and she was once nicknamed 'the Dancing Doctor'. It must have been her superhero identity, this is my headcannon now. In their dancing lesson Data again demonstrates his ability to mimic, meaning he could have learned from watching footage, but displays little understanding of when to stop or change moves. Crusher later helps Data to look at the genetics of the Ambassador's remains to solve the mystery of her apparent death. Crusher spots that the remains appear incomplete, suggesting they aren't real remains and have been manufactured. In the subsequent report to the Captain Crusher is there but only Data and Geordi speak. Data says: I consider Geordi to be my best friend. 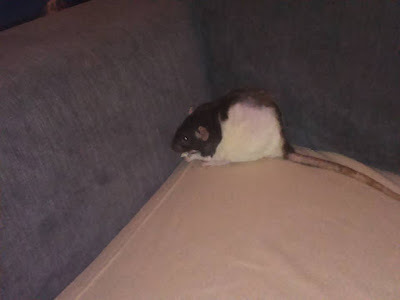 This episode makes me think that Geordi enjoys watching other people's drama. There's been evidence of this before, now that I think about it, something awkward happens to others and Geordi makes some comment when they're out of earshot. I don't think he stirs anything up or gets involved himself, but he definitely spectates. He's there when Data breaks Keiko's news to O'Brien and there's something in his manner that suggests he's at least a little entertained. He's also the one who insists that the couple will get married after all, and doesn't seem particularly sorry about it all. I wonder if the soon-to-be O'Briens have been entertaining him for a while? Perhaps he knows their pattern. Data says: I find Lieutenant Worf to be what is called a kindred spirit. We were both orphans rescued by Starfleet officers. In many ways, we are both still outsiders in human society. I hadn't thought about Data and Worf having the same origin story, but they do. The parallel is obvious once pointed out, though Data is trying to assimilate himself as best he can whereas Worf purposely holds himself aloof from humanity. Of course Data has no cultural background to fall back on and is just trying to find his own way, whereas Worf is in many ways a walking culture clash/identity crisis. Data says: Deanna Troi is the friend that I understand the least. Her life and duties are predicated in her understanding and perception of emotions. Data reckons that his lack of emotions means he's as mysterious to Troi as she is to him. I've said before that I don't fully buy his self-professed lack of emotions, but I expect that Troi can't sense anything from him using her abilities. Even so it doesn't make her treat him with any less respect (despite what she said about everyone feeling less real when she lost her empathic sense in the previous episode). She tries to advise Data on how to be a good friend to Keiko and O'Brien, but like Geordi she doesn't seem worried about them as a couple. They discuss marriage and she's surprised (as am I) that Data has considered marriage. It seems a very emotional thing for him to be interested in. Plus it would be a bit harsh on his spouse, by Data's own reckoning it would be a loveless marriage on one side. Of course Troi is encouraging because she's usually pretty positive about other people. Just before the wedding rehearsal his fiancee says she's calling it all off. He still has to go to work even though it's supposed to be his wedding day (or conversely is the day he got jilted). He has an awkward conversation with a superior officer/friend about getting his fiancee to change her mind. An Ambassador dies in front of him due to a malfunction in the equipment he has responsibility for, meaning extra work. Then the wedding happens, so that's nice. I mean we don't see much of the happy couple, but hey this isn't really about them is it. I get the impression that Keiko and Miles have one of those relationships. It looks like there's drama happening a lot and maybe that shouldn't work, but somehow it does for them. Both drag Data into things (Keiko starts it, but Miles isn't much better). When he hears the bad news Miles isn't sad or concerned, he's just immediately angry. The fact that no one else is worried suggests this is a pattern with them. It's not entirely out of character with what we see of their marriage in Deep Space Nine. I now have more of an idea why people seem to dislike Keiko. I always felt bad for her in DS9; not only do a lot of bad things happen to her family in that show, but Julian Bashir is basically the third person in her marriage (he's Camilla Parker-Bowles to her Princes Di, but with holodecks instead of adultery, I presume). That said I can see that this is a crappy introduction to the character. She flip-flops on whether to go through with her wedding and gets Data (a naive innocent in such matters) to act as go-between rather than talking to Miles herself. She happily breezes over things later, not explaining anything or reassuring Data at all, it makes her look fickle. Now I don't think Keiko is fickle, but we are given no background for her or context about her relationship with Miles. She's just there to provide drama and then marry O'Brien. The exposition tells us that Data introduced Keiko and Miles, that she's known Data for longer and has worked with him. That's not much to go on when you consider that the episode is keen to emphasise their friendship. It's not explicit that she's a botanist, although she is a room full of plants a couple of times. Did she work with Data on the Enterprise or a previous posting? Why would Data be working with a botanist? Why did the two of them particularly become friends? I don't think we're supposed to care. At the end of the episode Data relieves Worf on the Bridge and takes charge for the night-shift. The Bridge lights are dimmed, and I don't understand why. Of course most of the crew (except Data I guess) need to sleep and so there are shifts, but they're in space so why should one shift even be the night-shift? Why do these people have to work in lower light levels? I mean the rhythms of days and nights are entirely artificial on a starship anyway, so why not let each shift have their own day and night period? That way you can have people working around the clock in proper lighting, maybe have lower lighting in other areas, and no group is disadvantaged by working unsocial hours plus (for humans at least) bright light can help regulate their body clocks. Of course those on different shifts may not see much of each other, but that's true with traditional night-shifts anyway. At least this way people would only have to adjust their rhythms if they change shift or are going to planet (which must be an adjustment for everyone anyway) and no one feels like they're working through the night. There's a hairdressers on the Enterprise! See it's the kind of thing that logically must be there, but we never normally see. I like the Starfleet barber logo. 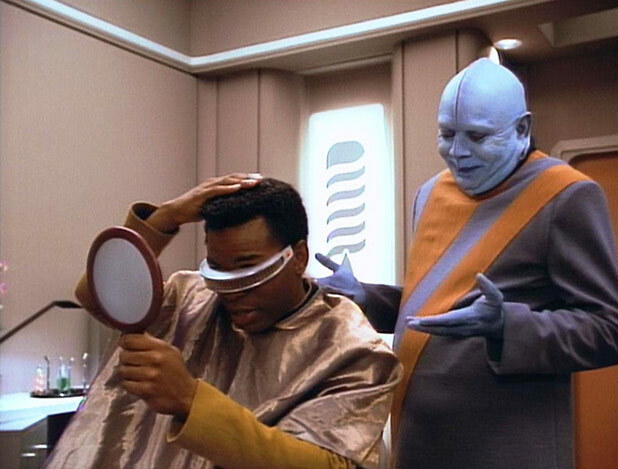 Do Starfleet hairdressers have their own Academy? In the background we see someone having their hair colour changed by a wand, that's pretty cool. If it were that easy and quick I'd definitely colour my hair more. There are polyamorous marriages! When discussing different ideas of marriage with Troi Data mentions that Andorian marriages usually require groups of 4 people. I bet we are never going to see this, but I guess it's good that it's out there somewhere. It was the nearly 90s, TV wasn't ready. I hope that a new Trek series explores more diverse stuff, it seems fitting to the spirit of the franchise. If you're a patient in the sickbay Data will just hang around watching you get treated? That seems odd. I don't think he would intrude on anyone's privacy, but equally he's not medical personnel and doesn't need to be there. 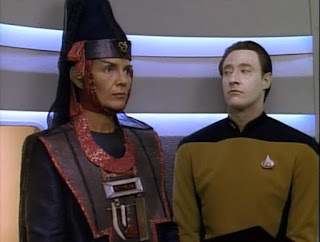 Though no one serving on the ship ever seems adverse to Data and everyone seems to get his situation, except Pulaski and she was kind of bigoted towards him. Plus he's the 2nd Officer, would you feel awkward asking him to leave? What isn't explored here (and possibly not ever) is that most of the people who are your friends on the ship are also your colleagues and that everyone has a rank and hierarchical position. There's seems to be the suggestion that this doesn't create a social hierarchy when it comes to socialising, but that seems unlikely to me. Do all new babies get shown to the Captain or something? Is it part of his duty to met all the people who are under his charge? I mean shouldn't that baby be with its mother rather than being left for senior officers to stare at? Senior staff who aren't Crusher do seem to just wander into sickbay whenever they like. It's Diwali! That's still a thing in the future, which is good since Christmas is also still a thing and if there are future Christians why shouldn't there be future Hindus. When reciting some stats about the day among birthdays and transfers and promotions Data mentions that it's the Hindu Festival of Lights. It's a throwaway line and we don't see any fireworks or celebrations or anything, but I guess it's nice that it got a mention. This outfit includes a long black cloak. She looks like a space wizard in mourning garb. Stark and logical this is not. For such an ascetic people Vulcan outfits display a lot of whimsy and frivolity. Not that this is bad thing, but there is a disconnect there. I mean the outfits of the Vulcan priestess/mages in Search for Spock struck me as highly illogical. For Keiko's wedding outfit I feel like the words "traditional Japanese" and "futuristic" were thrown together and what resulted from this was something that's the right shape but made entirely of plastic. Data comes to relieve Worf of Bridge duty. Worf hands off to Data with a list of various small but relevant things, mirroring the list Data recited at the start of the episode. The lights are dimmed because it's night-shift and these poor people working now better remember that. Data muses on humanity and his hopes of getting closer to it.